Rare Bird brewery, located on Nova Scotia’s Eastern Shore in Guysbrough, is one of Nova Scotia’s newest breweies, but is already receiving rave reviews. Full Steam Stout is a dark, roasty coffee stout – one of their regular offerings made with Authentic Seacoast (the maker of Rare Bird) Full Steam coffee. Appearance: As a stout should be, this is a pretty dark beer – dark with ruby highlights when put up to the light. Nearly opaque, but not quite. Aroma: The aroma is somewhat mineraly. There is also some fruity and dark roast (coffee and dark chocolate) aromas coming through. Taste: This first thing that is apparent are the alcohol notes. At 7% this is a strong beer and those notes come through, but fade as the beer warms (probably best drank at an elevated temperature). There is a bit of fruitiness and some hops. Not as roasty or as much dark roast/coffee character as would be expected. There is also a slight licorice flavour that appears after the second or third sip. Mouthfeel: The body is lighter than it looks – light to medium body. Light to medium carbonation. Overall: Not too bad. Light and easy to drink – not heavy on the palate. Better as it warms, I would place this one on the counter for a bit and not drink it right from the fridge. Probably would be a great one to age for a few months or years. Also, theres a nice buzz from that hit of coffee. Like us in Facebook, follow us in Twitter and Instagram, and be our friend on Untappd. 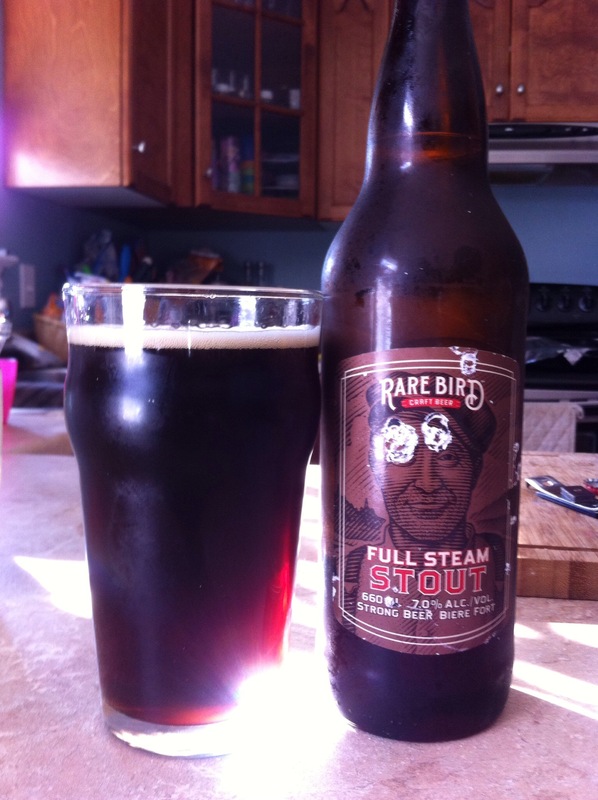 Rare Bird is brewed in Guysborough, Nova Scotia buy Authentic Seacoast Brewing Company. Using “pure artesian water”, hops, and Canadian malt they make small, handcrafted batches in Maritime brewing tradition. Appearance: Deep amber. Clear with a nice lasting head and good lacing. Aroma: A bit of hops, but not as predominate as many North American styled pale ales. Some light fruit notes, probably from the yeast used. Taste: Bitter on the back of the tongue, but sweeter up front. Some citrus and earthiness, with notes of caramel. Balanced overall. Mouthfeel: Medium to light body. Slight oiliness from hops. Overall: Nice and easy drinking, even at 7% not over powering in any aspect. This East Coast pale ale is well crafted with a beautiful balance that makes it a joy to drink.